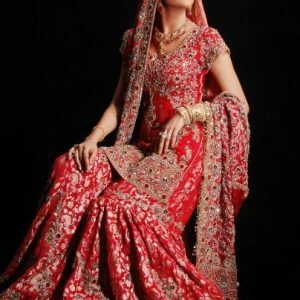 Tags: Banarsi, Chiffon, Colorful, Mehndi Green, Mehndi Mayon Henna, Sharara, Wedding Outfit. Top:- Mehndi green pure banarsi chiffon straight long shirt has been adorned with embroidered neckline. Small ornamental motifs scattered all over the shirt. Different embroidered appliques has been implemented on hemline. Fully lined dress. Concealed with back zip closure. Bottom:- Mendi green pure chiffon sharara. Small ornamental motifs scattered on the bottom of sharara. Sharara is finished with banarsi fabric. Fully elastic. Dupatta:- Mehndi green pure banarsi dupatta. Finished with banarsi fabric on edges. 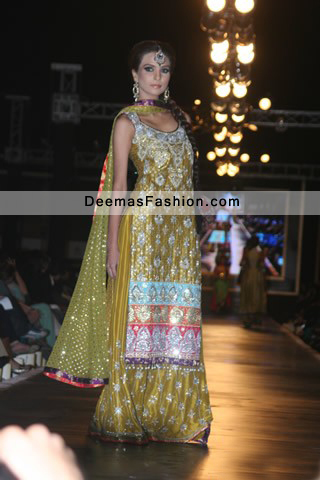 Embellishment work includes silver tila, kora, dabka, naqshi, stones and sequins.